One Small Overlooked Muscle that Will Improve Your Skiing! Quads are on fire, back is fatigued, and shins are sore…ever felt this way after your first day on the snow? 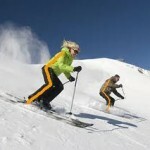 A ski stance similar to one the pictured to below, right side of the gentleman in the background – he has little ankle flex and hips behind his feet – firing up those quads! We often attribute these feelings to the fact that we may not have trained properly for the ski season, we are “out” of ski shape and/or we need to improve our ski technique. While these may be true, it also may be due to one small muscle that most people do not consciously use and/or know how to use when skiing or fitness training. The muscle is called the tibialis anterior. The what? Huh? 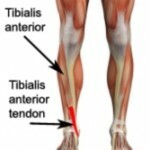 The tibialis anterior is located along the front of the shin and crosses the ankle joint. When contracted this muscle allows us to lift the top of your foot toward the body and top of boot; flex our ankle or in “fancy” terms dorsiflex our ankle. 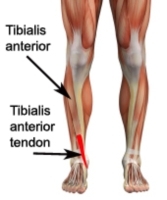 What does the tibialis anterior (TA) do for us when we are skiing? In skiing, when the TA contracts it helps pull our shin into the front of our boot cuff. It also, can assist in pulling our body forward when we feel that we are falling backwards. Ultimately this movement shifts our center of mass over our feet with very little movements elsewhere in our body (skier in foreground of picture to right). Often in skiing we are coached to push our shins into our boots (people bend their knees) or flex our ankles (most people do not understand HOW) and while these will create shin/cuff contact I call them static movements – you’re camping out on the front of the boot. 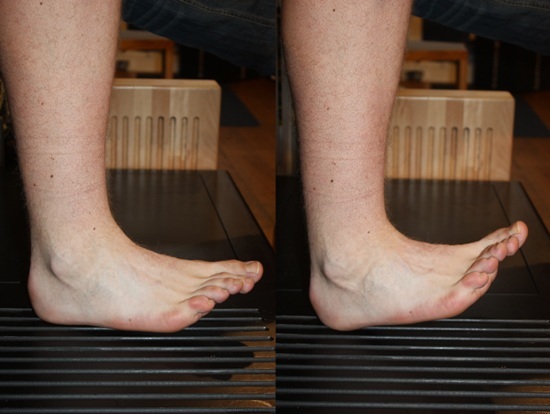 By adding dorsiflexion at the ankle you create more shin cuff contact, range of motion and effect on the ski – a more active engagement of the TA. Also, the TA inverts our foot. Imagine raising the big toe side of your foot; as if to look for gum on bottom of your shoe. At the beginning of a turn, inversion of the inside ankle (concentric, shortening) and eversion or eccentric (lengthening) of the TA on the outside foot help to tip our skis on edge and/or move from one set edges to the other set of edges. As you can see, two small movements at our ankle allow us to move out of the “backseat”, thigh burning, back screaming, fatiguing early season stance and aid in the edging of our skis. A great way to learn and feel this muscle is to sit down in a chair and feel your shin. Touch the hard bone near the top. Now run your fingers toward the outside of your leg while pulling the ball of your foot toward the shin. Do you feel that muscle engaging? That fleshy muscle is your TA. This is the muscle that controls the angles at your ankles and helps manage the location of your center of mass over your feet. And this motion of raising the ball of the foot is how we control it. Now stand up, and slowly engage that same muscle by pulling the ball of foot up and pressing the shin toward foot. Notice what happens to your body? Your entire body moves forward. If you were wearing ski boots, your shins would engage against the boot cuff, center of mass would move forward applying pressure to the front of the skis, pressing them down against the snow, achieving a more balanced pressure along the length of the ski and enhancing interaction with the snow. Before revealing how to strengthen the TA let me share with you one way that you can aggravate this muscle and/or mostly it’s tendon that crosses the ankle to the foot. Excessive tightening of the boot buckles can result in repeated rubbing and constriction of the tendon. If you feel discomfort or pain across the top of the foot loosen your boot buckles for relief. Place right foot in front of left (feet hip width apart). Place both hands above right (front) knee (keeping right foot anchored to floor). Prevent the knee and hip from moving. Lift ball of right foot as high as you can (dorsiflex ankle) toward the shin, heel remains on floor and then tap your right foot as fast as you. Continue for 30-60 seconds, switch feet. The goal is to keep the foot lifting as high as it can and tapping as fast as possible without losing speed. The TA is one of the most overlooked muscles by skiers. 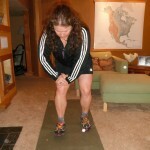 When skiing powder, crud or you’re caught back on the tails of your skis, this muscle is crucial for recovering balance. Skiers lever their bodies forward using their toes (dorsiflex the ankle) against top of boot. This happens to all of us! 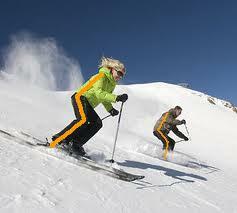 So, TA strength is essential for efficient skiing. Who knew! Yes, this is a very small, subtle and essential movement for all skiers to learn. Practice on land, focus on how you move the ankle/foot with this muscle and key in on how the muscle feels when working! 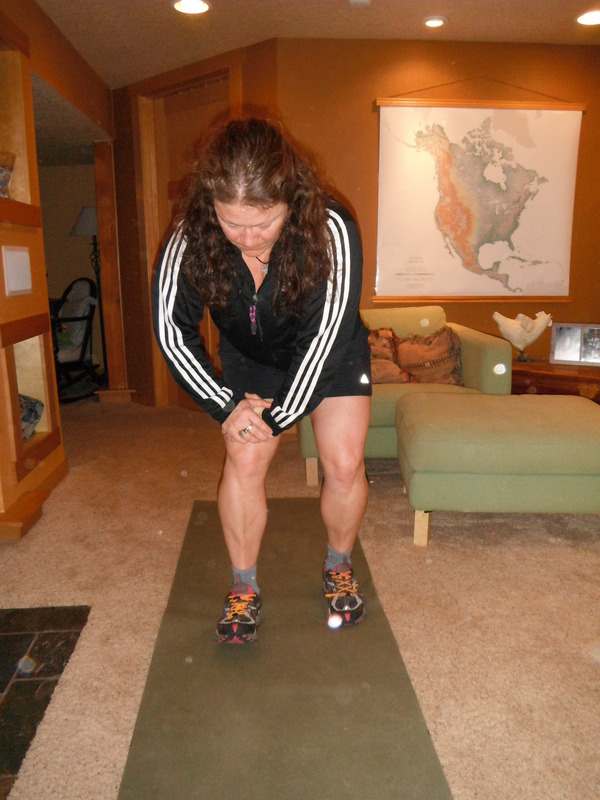 Toe taps to strengthening the tibialis anterior – one exercise, one muscle that makes a huge impact and improvement in your skiing. To learn more ways to increase TA strength look for the release of my upcoming “12-week PEAK Ski Conditioning program.” In the meantime, if you have any questions or would like more details on off-season ski conditioning contact Jennifer Lockwood. Jennifer is the owner of PEAK fitness NW, 20 year Certified Personal Trainer, 10 year PSIA Alpine Instructor at Mt. Hood Meadows and 20 year Ski Conditioning program designer. She can be reached at jenn@peakfitnessnw.com or 503.913.8385. Mt. Tabor, Mondays @ 6pm, July 8-22 & August 5-19, 6 weeks, deadline Sunday, July 7th! Durham City Park, Thursdays @ 6pm, July 10-24 & August 7-21, 6 weeks, deadline Tuesday, July 5th!